At Beau Wine Tours, we love introducing our guests to cream of the crop Napa Valley wineries. Our chauffeurs specialize in showing you new wine tasting experiences, whether that means sending you to a producer you’ve never tried or to a part of the valley you haven’t seen! Most visitors don’t realize the Napa Valley is split into unique “AVAs” or American Viticultural Areas, characterized by terroir, elevation, and microclimate. One of our favorites, Coombsville, is a hidden gem. Nestled to the east in the Vaca Mountain Range, Coombsville is known for its diverse elevations which are exposed to the cooling fog of nearby San Pablo Bay. This particular Coombsville AVA is ideal for growing rich, complex reds like Cabernets and Syrahs. But, it is also home to a number of lauded white wines. Producers here embrace a deep connection to the land. Each Coombsville vintage reflects the character of vineyards that vary slope-to-slope and acre-by-acre to produce a stunning range of flavors and textures in the glass. Join us on a virtual tour of some of our favorite producers and Napa Valley wineries in Coombsville! Ensconced underground within the foothills of the Vaca Mountain Range, Covert Estate lives up to its name! Only visible from a bird’s eye view, the estate and winery seek to make as minimal a footprint on the land as possible. The winery is proud to be certified by Napa Green as a sustainable facility. But Covert Estate is a secret that just won’t keep. The Cabernet Sauvignon and Cabernet Franc produced by the winery and only available by allocation are just too good. The winery is a fruitful collaboration between three families. Cal and Pam Nicholson with David and Laura Nestor make up the California contingent. Julien and Elán Fayard make wine in both France and California. This provides insight into the wineries philosophy. Covert Estate embraces the wisdom of both Old and New World wines by taking what its team considers the best techniques and ideals from either side of the ocean. The winemaking team seeks to capture the winery’s character with each bottle. The unique terroir of Coombsville gives the grapes a long, slow season to ripen – increasing complexity. We know you’ll find a visit to Covert Estate an excellent addition to your tour of Napa Valley wineries. Tastings are by appointment only. Azur, a Coombsville winery Fayard shares with his wife Elán, focuses on viticulture and the winemaking process. They see winemaking as an art that starts at the top of the growing season each year. First, captured in the bottle, then in the glass. Fayard studied under such world-renowned Chateaus in France as Lafite Rothschild and Smith Haut Lafitte. His approach seeks not to control the wines he makes. Instead, he works with the natural flavors, structures, and complexities that arise from the unique combinations of vineyard and vintage. His wife Elán brings her own experiences from Napa Valley wineries, the Willamette Valley in Oregon, and the Loire Valley in France—as well as time spent in Bordeaux and Provence. The fact that this experienced couple chose Coombsville as the AVA for their own label speaks volumes about the area’s terroir. You and your Napa Valley wine tour can taste these exceptional, terroir-driven wines at the Vintner’s Collective. Take note, however, that private tastings are also available by special arrangement. And there’s plenty you’ll want to try. Current releases include a Rosé and a Sauvignon Blanc for warm-weather sipping, as well as red selections like the Propriety Red, the Classic Cabernet, and the Azur Reserve. 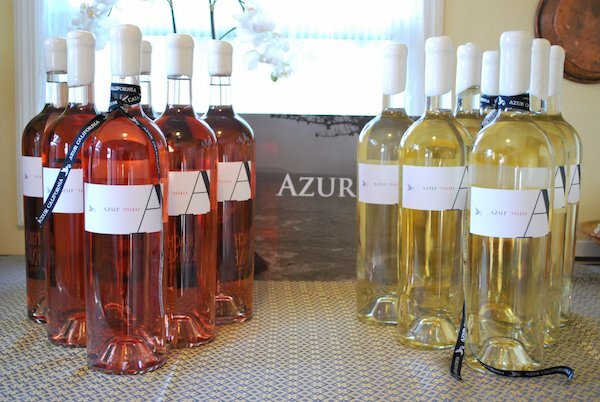 Once you’ve determined your favorites, Azur offers a number of allocation programs to suit your personal cellar needs with special benefits and discounts. At Black Cat Vineyards, winemaking is a deeply personal and spiritual pursuit. It involves understanding, cultivating, and reflecting the “soul of the vineyard.” Proprietor and winemaker Tracey Reichow elaborates on this idea as she describes her philosophy. Reichow’s wines are produced in small quantities, so all tastings are private and by invitation or referral only. Varietals include Cabernet Sauvignon, Zinfandel, Syrah, Chardonnay, and a Rosé. BEWARE – most sell out quickly, and often to members of the wine club! What makes these wines so desirable? Part of the answer lies in the fruit Reichow uses, sourced from estate vineyards in Coombsville, as well as vineyards in the famed Rutherford and Howell Mountain AVAs. Member-only wines like the Winemaker’s Reserve Cabernet and the Cabernet Franc come out of Rutherford. The Zinfandel is sourced from Howell Mountain, where steep slopes provide sun exposure and rocky soils ideal for this juicy, yet elegant grape to shine! Another of the winery’s strengths is in the charm of its name, derived from a feral black cat who came to the property and became a companion to Reichow. The two were so close, she named her winery for him. Although “Black Cat” has passed on, his relationship with Reichow inspired her family to continue to adopt and care for other feral cats. Add Black Cat Vineyard to your group wine tour! At Caldwell Vineyards, it’s hard to separate the wine from proprietor John Caldwell and the vaunted legends of his rise in the Napa Valley. Caldwell is most famous for having introduced what is now the industry standard in rootstock and vine clones to California. How he came to introduce them to the area is a source of debate. During the 1980s, Napa Valley vineyards were on the brink of an epidemic from the vine disease phylloxera. To avoid the risks associated with it, Caldwell smuggled in a series of grapevines from France, eluding customs to plant his first vineyards. The venture was a success – you can read Caldwell’s whole story here. Over time, he has come to embrace his reputation as a maverick in the wine industry. And for good reason. The Caldwell estate encompasses 123 acres, and is one of the only American wineries to have its own on-site cooperage. The terroir of Caldwell Vineyards showcases some of the best sites for growing wine grapes in the Coombsville area. Calwell’s expert producer takes advantage of changing elevation, volcanic soils, and exposure to the San Pablo Bay to successfully grow ten varietals (including twenty-six clones). With a crack team of seven full-time vineyard workers and lauded winemaker Marbue Marke, Caldwell produces a number of special bottlings from estate fruit. Tasting these meticulously made wines is a real treat for our Napa Valley wine tours. To top it off, all wine tastings at Caldwell take place in the working wine cave, 90 feet underground! Tastings are by appointment only, and include six or more of the current release wines. These include white varietals like Chardonnay and Sauvignon Blanc, as well as a number of juicy reds, like Carmenere, Petit Verdot, Cabernet Sauvignon, and Merlot. Caldwell Vineyards is well worth a visit – come for the outstanding wines, and stay for the outrageous stories! Shadybrook Estate offers Napa Valley visitors the chance to see the Valley as the original ranchers did – from horseback! The Estate itself was created by wine enthusiasts Alice and David Alkosser, who looked the world over for a winery of their own and settled on the unique land and climate of Coombsville. Their state-of-the-art winery shares land with the historic Rapp Ranch. They make wine from their 25 hillside acres in Coombsville as well as their acreage at the foot of famed Howell Mountain. Today, Shadybrook Estate offers visitors several tasting experiences, from the more traditional wine flights and cheese pairings to those centered around trail rides at the ranch. 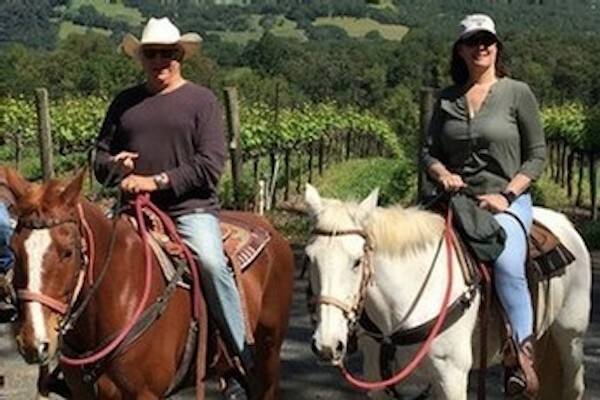 The “Ultimate Ranch Experience” includes a thirty-minute horseback ride and a tour on foot of the winemaking facilities. It ends with a flight of Shadybrook wines paired with small bites at the patio garden lounge. Not to mention the concluding view of the beautiful Coombsville hills. For a personalized experience, book a longer trail ride with barrel samples. Add on a secluded spot to taste wines with your sweetheart. The wines of Shadybrook are worth making the trip or ride for! The estate vineyards are carefully farmed to bring out rich and nuanced characters, as in their unusual Platiné Blanc offering. The beverage is described as bright and clean with Meyer lemon and apricot notes. Of course, red wines include Napa Valley favorites like Cabernet Sauvignon and Malbec, among others. You’ll have to saddle up and hit the trails to taste some for yourself! Gorgeous views and world-class wines–from producers whose small-lot productions keep their bottlings a treasured secret… for now! The Coombsville AVA is an excellent choice for any Napa Valley wine tour.